For the past couple of years, our brining and smoking method for salmon, trout, sturgeon and other fish has been the most popular article on our blog. Here it is again, with updated notes and photos. If you’ve ever looked at those electric smokers sold in sporting goods stores and wondered if they did the job, the short answer is, “They do.” Our favorites are the Big Chief, Little Chief and Mini Chief models made by Smokehouse in Hood River Valley Oregon. Inexpensive, easy to use, easy to store and efficient, these smokers come with complete directions and a useful booklet that details the how-to of smoking and provides a number of recipes for fish, shellfish, poultry, meat, cheese, and even noodles, soup and breads. My own most recent experiment with smoking was sea salt. It came out… smokey! To obtain the best smoked fish, start with high-quality fish. Fresh fillets from bright fish make for a far better product than poorly cared for fillets from a badly handled fish. Also – and this is important -the method we use is not designed to kill parasites. We typically freeze fillets in a cold freezer for 24 hours before smoking them in order to ensure that they are parasite-free. 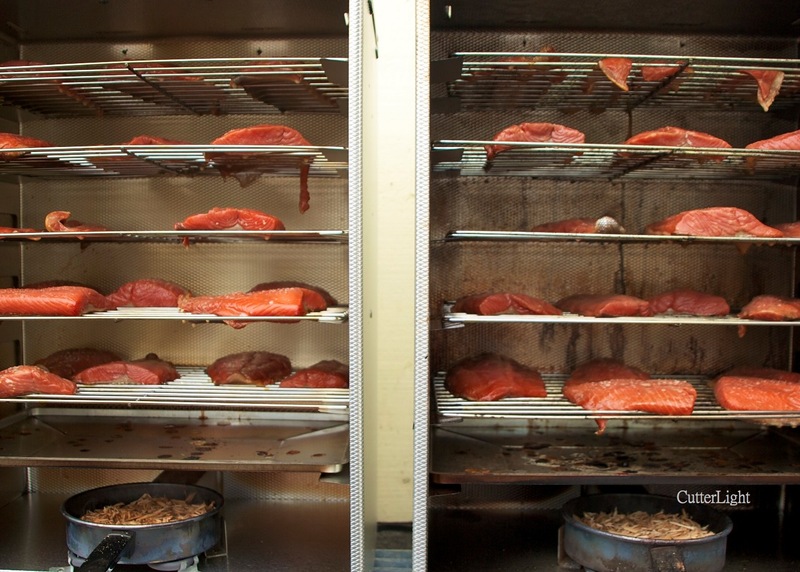 Below: A double batch of sockeye salmon in side-by-side Big Chief smokers. For salmon, trout, sturgeon and similar fish with fairly firm meat, we marinate fillets in a wet brine for roughly six to 10 hours depending on the size and thickness of the fish or fillets. The fish can be brined in non-reactive glass, plastic or stainless steel (not aluminum) pans in the refrigerator or in a bucket or cooler with a couple of sealed Ziplock bags of ice thrown in to keep the mixture cool. Following are the step-by-step instructions we use for whole small trout and the fillets of salmon and other fish. The recipe can easily be modified to add other flavors or to finish the smoked fish with a sesame seed glaze. 8 to 10 pounds fillets, skin on, rinsed, patted dry, cut into small pieces. A good size is about 3″ x 6″, but smaller or slightly larger is fine. Small trout can be cleaned and smoked whole. Mix brining ingredients together in a large bowl. Pour mixture over fillets, making sure they are covered, or until they float. Cover containers and marinate for about 8 hours (or overnight) in the refrigerator. Remove fillets from brine, pat dry with paper towels, and arrange on racks to dry for about an hour – until a glaze forms on the surface of the fish. 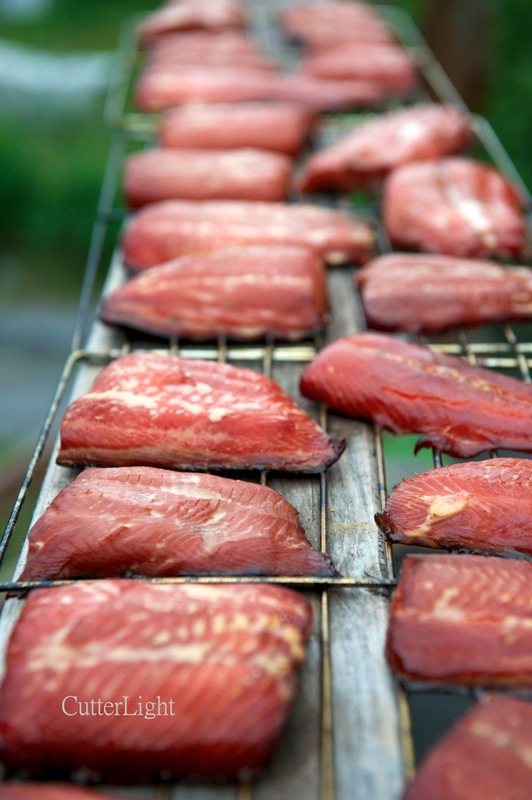 Smoke fish according to your smoker’s directions with alder wood, mesquite, fruit tree or hickory chips. Check occasionally, keeping in mind that air temperature will influence smoking time. Typical smoking times range from 6 to 12 hours. A slightly wet product is best suited for many of the recipes we enjoy and for canning. For straight snacking, a drier product may be preferred. Great shot! Looks suspiciously like our hooligan pic! thanks for reposting! This inspired me yesterday. I had purchased a sockeye salmon filet and wanted to do something I hadn’t tried before. So, I used your marinade as an inspiration. I also found another marinade that uses honey, with mostly the same other ingredients. I didn’t have brown sugar, but I do have sorgum (sp?) molasses. I adjusted the quantities for the small amount of salmon I was making, marinated it for 1 hour, and placed it on a hot grill (I wanted to use a cedar plank, but realized I didn’t have any left). I set aside some of the marinade to brush on the fish while cooking as well as after taking it off the grill. OH MY! was it ever YUMMY!! Glad to hear you tried this and liked it! We, too, freely substitute ingredients in this basic recipe. Maple syrup is good in it too! Adjusting the quantities of the ingredients, I used this as a marinade for wild caught sockeye salmon the other day. I also subbed sorgum (sp?) molasses for the brown sugar. Oh boy did it turn out great! Thanks for the reblog, as always Cathy! We got notes that others used molasses in this recipe with good results. Silvers are in now, with lots of fish be caught near the mouth of Resurrection Bay. We went out for a short time yesterday and got a few. Will go out again this week and really give it a go! Wish I lived there during salmon fishing time… Have fun! I recently got a small smoker and this was the first recipe that I tried in it. After tasting the results, I couldn’t wait to do it again! I have since used this brine on some chicken breasts that have gone through the smoker and the results were equally as good. I’m sold on this becoming my go to brine recipe. Great job! Hi, fellow salmon fanciers – thank you for the like. : This is fantastic, I used to hot smoke stuff in my wok and now on the barbecue but this goes on my must-have list for future abodes. Now, I must take a look at the rest of your posts… N.
Love the salmon! Thanks for reading! Great how-to! I’ll be following this guide on the weekend when I bust out my Little Chief for the first smoke of the season! Thanks for reading. This is a great recipe – and one of our most popular posts. Enjoy! Going to try this one looks good. Thanks for checking us out. Enjoy! What temperature do you smoke your salmon to? For a wetter product. The temperature in a typical hot smoker – such as a Big Chief – will range from about 125 degrees F to about 180 degrees F depending on air temperatures, whether it’s in the sun or in shade, and weather or not you insulate it. This is hot enough to thoroughly cook meat, given enough time, and it’s time, more than heat, that you’ll want to pay attention to. At air temperatures from the 60’s on up, I don’t use insulation. At temperatures below 60, I usually wrap my smoker in insulation and have had good success smoking in temperatures as low as the 20’s. As you might imagine, smoking time can vary quite a bit. For the wetter finished product you’re seeking, about 8 hours in the smoker is a good ballpark figure for salmon fillets (but I’ve gone as short as 6 hours when the smoker’s running hot). For smaller trout fillets, the time can be reduced. When you see lots of fat building up on the fillets, take one out and cut through it to assess it’s doneness. Once the fillets are smoked, they’ll last about two weeks in the fridge. Sealed in vacuum pack bags, they’ll last indefinitely in a good manual defrost freezer. Smoking is time consuming, but it’s not difficult, and when you break out your smoked salmon at the next football game or party, your friends will be impressed. Correct. Freezing salmon prior to smoking ensures that any parasites will be killed – which is why sushi chefs freeze fish before serving it. The best way to ensure for bacteria-free fish is to get harvested fish on ice as soon as possible and then into the freezer. Make sure you promptly bleed your catch (by cutting its gills), too, for the best possible taste and appearance, and then clean them as soon as you can. (If you didn’t bleed your catch, it will still be OK, but remember to do it next time – it makes a difference.) Keep the salmon cold when brining it – we place our Pyrex brining dishes in the refrigerator. Once the smoking process is going, the fillets will be fine as long as you keep the smoker hot. When the smoking process is finished, package and refrigerate the fillets. Don’t hesitate to drop a line if you have additional questions. Hello, in Alaska some natives enjoy cold smoked or non-cooked. When the fat shows on top of the meat they believe it’s too hot/ruined. For me personally I like it any way-it’s so good. My friends think you should only smoke salmon for a few hours before jarring or it will be overdone. As an instructor at a native school building smokers, the kids showed me the way they were taught. It was a learning experience from villages all over Alaska. Some sliced the fish into strips 3/4″ thick with the skin on to hold it while hanging in the smoker to dry to get the ‘skin’ on. My King Island relatives leave a fillet intact but slice it cross section in 1″ widths being careful not to cut through the skin when hung over the support-non-Little Chief style. On salting, potato floating is a common method, dip in, dip in just water and pat dry before smoker to skin prior to smoking. I’ve had it-it’s great too. It’s hard to mess up good fish!! I’m trying this recipe for halibut-will let you know, thank you👍. Thanks for the information. I will be smoking two salmon and half a steelhead tomorrow after noon. Again thanks for the information. Mike, congrats on the great fishing! Thanks guys, we’re just starting to get into the idea of smoking. I found your post super informative, we’re just getting into homesteading and we’re collating all the information we can absorb to help us get set up. Your blog post really helped helped us along on this topic. The homesteading life has always intrigued us. Wishing you the best of good fortune! Currious after smoking anyone tried canning? All I can say about canning this recipe is yes we’ve done it. And you will literally not be able to can or jar enough of this. All of your friends will want it. It’s really, really good. I have been trying different recipes for Northern Pike and was intrigued by the use of the soy sauce in this recipe. I mixed it exactly as posted here and smoked at 190 F for a little over 3 hours. The results were nothing short of fantastic. Thanks for a super tasty and easy recipe! With small trout fillets how long would you brine and smoke. I have about three pounds of small fillets. So I cut the recipe in half, brined them for four hours, and smoked them for about six hours (three pans worth of chips) and they turned out moist and tasty. I have a older little chief smoker and it seems to take a long time for the chips to start smoking is this an issue? Also when drying after brining how do I know when they are to the right point of glaze? I’ve noticed that as well – that some of the older Little Chief and Big Chiefs run cooler than the new models. You can buy insulation for them, and it works well to keep the temperature up. The insulation is useful in cool or breezy weather. You do want the smoker to heat up… there are some posts online about this. As for the brined fish, their should be an observable glaze on them that feels slightly sticky. Hope this helped. And glad your trout came out nicely. I used this with trout. My grandkids and I were eating it right off the smoker. It was great. Opinions on using this for making elk jerkey? i noticed you don’t mention rinsing the fillets after soaking in the brine. Hi Tony, Thanks for the note. In the past, I’ve rinsed the fillets and not rinsed them. Haven’t noticed much difference in the final product. Combine ingredients in a heavy small pot, slowly simmer and reduce by 1/2. Cool. Can be refrigerated a couple of months just return glaze to room temp. before using..
For over 40 years, I’ve sworn that I don’t eat ANY freshwater fish. Ok, so rules are made to be broken. Used this recipe to brine some trout that someone stuck in my freezer several months ago. Brined overnight, smoked using pecan shells at 200 degrees for three hours. SCARY good! I may actually have to change my thinking! Thanks for checking in, Cass! Your idea about a post on Mongolian meat dishes is excellent. This is very much a meat (and dairy) culture cuisine wise – and one that hasn’t been sufficiently explored and appreciated by non-Mongolians. Yes, we’ve had horse meat here – as well as mare’s milk products. The dishes we’ve had have been quite good. I do remember our meal of boar in Mie-ken. Personally, I loved it. My recollection is that compared with domesticated pork, it was lean and more strongly flavored. Man, what a food and drink paradise Japan was in those days. Still is. Always great hearing from you. Hey Love the site and the information on it! I am just getting into smoking fish, just took my first batch out of the smoker and it is ok but not amazing. So I will have to try your recipe on the next batch. But my question is: I am going out on a remote fishing trip way out in the back country where ice and fridges are not available. Any idea on how to smoke and preserve fish while on the trip and to pack home? From northern Ontario…Thank you for the recipe. Ive try it will Lake Trout and Pike and it was a great seller. Cant fit enough in my Little chief though ..Im thinking of upgrading to a larger smoker. I have vacuum sealed a few filets. What is the shelf like of refrigerated smoked vacuum packed fish? Will freezing changed the taste much or make it soggy. And you mentioned canning … so pieces of smoked fish in a mason jar in pressure cooker would do the trick? Do I need I little bit of liquid in the jar though? This is amazing! My husband and I loved this. We did trout and I snuck a piece of salmon in for me. It was so good. I can’t wait for him to bring home more trout….Thanks for an awesome recipe. electric smoker did a good job, it is transforming our life. this is a quality food and also enjoyable. drooling here in british Columbia! Caught 6 rainbows yesterday and will be putting them in the little chief shortly. 35 degrees celcius outside right now so they should be done pretty quickly. Thanks for the recipe! Really, Black and grey for recipes. wow, no real way of printing a recipe. This is how I print them. Highlight the area you wish to print. Hold ctrl and the letter C together to copy the highlighted print. Go to your email and select ‘write’ as if you were sending an email. Set your courser in the message area. Hit ctrl and the letter V to paste the highlighted print. Address the email to yourself. Thanks for the feedback, Tim. The ginger infused soy sauce sounds interesting. Happy smoking! Thanks! Tonight I’m using this brine recipe for the 4th time in 4 weeks. The extended family now has a new favorite smoked salmon, and they’re regularly bringing Safeway salmon over for the full treatment: 8 hours in your brine, 6 hours in my Little Chief front-loader. This week I finally was smart enough to have them bring me some brown sugar and Tupperware along with the fish. Thanks again!! Hi I am wondering if this brine recipe with soy can be stored in freezer for any amount of time then reused ?. I fish often and would like to be able to reuse on short notice if possible . We have a small fridge so that’s not an option for me .I would imagine salt may have to be added after a bit .thanks in advance for any feed back . Love your site, Thanks everyone for great input. 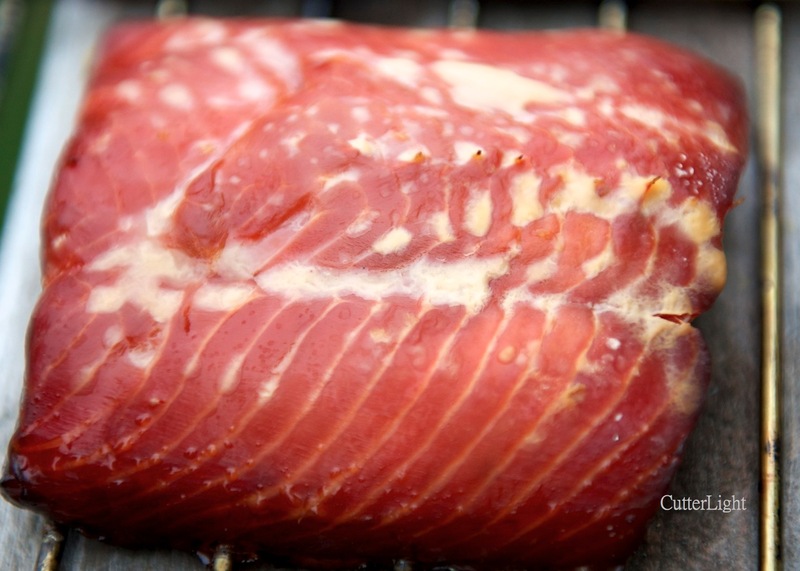 Set your salmon out to come to room temperature just before smoking. Then start with a hotter smoker – about 150 to 160 degrees. Then reduce your total smoking time. My guess is that you are smoking too long and drying out your fish. Let me know if this helps, Edward. I will, by the way do You also cut small trouts for pieces or smoke them in one piece? Really glad I could help, Edward. Happy smoking! Can this recipe be used for cold smoking, if so how long would you guess to leave in the smoker. I am using salmon filets about 3X3 and an inch thick. Good evening, I’m playing condiment (catch up “catsup”) in I’ve just read the 2015 posts. As far as cold smoking, I bought my Lil Chief when I was stationed in Alaska in the mid 1970’s. I would smoke during the winter after wrapping the smoker with a blanket, and it would take 24-36 hours. It would be a great soft consistenticy, good for salmon patties and/or as an addition for topping a salad or as a base for a dip. During the summer,the time would be 12 to 16 hours, using 4 pans of chips in either case. I want to quick smoke/cook salmon on the grill to eat for dinner (my recipe says 20 min) after soaking in a similar brine for a couple of hours. I have more fish than well eat now. How long can I freeze the extra fillets in brine before I need to quick smoke/cook them? Thank you! All I have is a manual defrost freezerI decided to experiment a little and freeze some in brine and see… When I checked on them, the fillets were frozen solid in the brine slush. They had been in the freezer about 7 or 8 hours. I drained the brine off, put them in individual Ziploc bags, double bagged them, and put them back in the freezer. It’ll be interesting to see how the flavor and texture come out. They really won’t have to store very long. We are inland and haven’t ever had a quantity of fish to deal with. Im going to try this out tomorrow. I have 15 trout ranging from 10-12 inches, small trout. How long should I leave them in the brine? I’m thinking 8 hours is going to be too long? I am smoking them whole, not filleted. I’ve never smoked small fish, usually salmon fillets. How long would you smoke these, at what temp, to get a sticky, drier (not jerky though) snacking product. My mother, bless her heart, thinks 12 hours lol. I was thinking more like 2-3 hours, depending on the temp they are smoked at. Now THAT is an intriguing idea. I never would have thought to Smoker Fish but that looks delicious! re: the ginger ingredient–is it fresh or dried/ground? Thanks for the question, Ed. My guess is that you aren’t letting the salmon fillets dry out long enough after you brine them. After you take the fillets out of the brine, pat them dry with paper towels. Place them on wire racks and put them in a cool place – such as your refrigerator – to dry out for at least eight hours. I usually let my salmon dry out for about 12 hours. thats a great hint I usually dry an hour till pelicle appear , if I can ask what temperature do You start smoking and how do You gradually change it? great , cold smoker means outdoor temperature I guess, I did read several articles regards when fish is done and come in opinion that somware between 125 to 130 F in thicker part of fish what do You think about that ? I’ve never stuck a thermometer in my fish, but based on other cooking I’ve done, I’d guess that that’s about right for cold smoking. I tried this brine on flounder today and let me just say, amazing. Little different from what I usually brine with,but none the less. I was looking for something different and I really enjoyed it. I’ve been using smokers since I was young living on lake powell. My dad used an old refrigerator as a smoker. So as I grew up I started to explore different forms of smokers. I’ve built some pretty amazing ones but I keep coming back to my clay pot smoker. Thanks again for the brine recipe it is great. I hope to try it on salmon next week. What a fun assignment – and what a great recipe came out of it! This is stunning! The combination of flavors sounds killer-good, and I love the addition of hard-boiled egg. Never knew my life was missing Nordic food, but apparently it surely was! I just used your soy sauce recipe on a blue Marlin we caught in Hawaii. Added some sesame oil to the brine. Soaked for two days in the fridge and after damping the fish with paper towel, I sprinkle with sesame seeds and a Montreal pepper spice mix. Smoked at 150 degrees for 2.5 hours or until golden brown appearance. Oh was it yummy, but I must warn you, I like strong brine. It was very good though. Torrow we smoke the 3-day soak. Yikes! Hi, I make and sell a pretty similar smoked salmon. Now the capacity of my smoker isn’t enough. What brand are the smokers of the third picture or where could a get similar one? I think these are a pair of Little Chief smokers. Check out the line of Big Chief and Little Chief smokers manufactured by Luhr-Jensen, probably the most popular smokers in America. We’ve used them for many years. Another smoker we like is Weber’s charcoal smoker. Hands down Awesome brine for Salmon. Thank you. I’m a novice in smoking meats….it turned out really well. Yummy. Using this brine on what they call Salmon Candy ,going to make it on the drier side ,I’m going to glaze with a maple /apricot mixture ,can’t wait till morning …. Great post. We have been using an almost identical recipe for years that we learned from my father Gene Rizzi in Gold Beach, Oregon back in the 1980’s.. We go just a bit heavier on the soy. We used a Little Chief when we lived in Oregon. Then we moved to Italy where portable smokers are unheard of. When we moved back to the U.S. we bought a new digital smoker and have been real happy with it. I have to admit the salmon here in North Carolina is obviously not “wild” and I hate to smoke store bought fish. I finally found a supplier of wild salmon but it’s not the same as I fish I caught this morning. I do smoke local trout with great results. Good to see something from a pro here. Thanks! I am in NC also and have a friend that regularly catches trout in the mountain. I discovered the A-Maze-N cold smoker. I brine the trout overnight, dry for 6-8 hrs to form a pennicle then coolish / cold smoike on my big green egg. OMG it is the best trout I have ever had. I use the Applewood or pear/apple blend they sometimes have. If the fillets are really large sometimes I add a little heat at the end to make sure they are fully cooked..
After I smoke trout, I often flake it into whipped cream cheese to make a smoked trout spread. Super yummy. Love smoked trout spread prepared that way! I followed the receipe as best I could (substituted raw cane sugar and maple syrup for the brown sugar I was lacking) and applied it to a limit of stocked browns and rainbows. I now know what ‘trout candy’ means. Thank You. “Trout Candy” – love it! And agreed, this is a great way to utilize those stockers.